In 1968, Frederick Hammersley moved from Los Angeles to Albuquerque to teach at the University of New Mexico. Soon after his arrival at the university, sculptor Charles Mattox introduced Hammersley to the engineer who was in charge of the university's new IBM mainframe computer. The possibility of image making facilitated by a computer captivated Hammersley's imagination, and resulted in a series of over 72 drawings. Hammersley utilized the computer program ART I, which was developed by the university's Department of Electrical Engineering and Computer Science. ART I contains approximately 350 statements written in the programming language FORTRAN IV. Hammersley made his computer drawings using the 26 letters of the alphabet, 10 numerals and 11 symbols. The working area of each drawing was made up of a field of 50 characters in height and 105 characters in width. Two printing arrays were possible; that is, a second series of characters could be printed over an initial layer. The printer placed the vertical characters closer together than the horizontal characters, resulting in a printed rectangular field approximately 8 by 10 inches, on paper measuring 11 by 14 3/4 inches. Left and right edges of the paper were perforated with 1/8 inch holes that guided the paper through the printer. The ink was black, and the paper white. The images that resulted were geometrical compositions that featured a variety of forms including squares, circles, diamonds, zigzags, arches, curves and waves as well as all-over patterning, with dark and light tones created through Hammersley's choice of spacing of characters, in either single or dual array. The combinations seemed endless, and Hammersley reveled in exploring nuances, making unique variations of images that he favored. The decade that followed the computer drawing activity was one of immense painting activity for the artist. 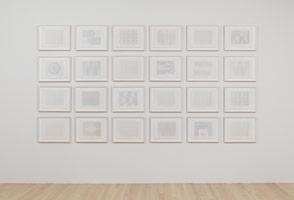 During 1970-72, Hammersley focused on a series of black and white compositions, one of which (You’re just like your mother, #6 1972) earned him a Guggenheim Fellowship in 1973. In the years that followed, Hammersley produced the largest geometric paintings of his career, which displayed a rich diversity of form, color and composition. The current L.A. Louver exhibition includes over 50 computer drawings, as well as 2 paintings created shortly thereafter: There now, #8 1970-71 and Back and white, #2 1971. Born in Salt Lake City in 1919, Hammersley studied art in San Francisco, and later in Los Angeles at the Chouinard Art Institute. In 1942, he was drafted into the army, but returned to the US in 1946 to resume his studies, subsidized by the GI Bill. Hammersley went on to teach (at Jepson, Pomona College, Pasadena Art Museum and Chouinard), and exhibited widely in California throughout the 1960s, with solo shows at the Pasadena Art Museum, 1961; the California Palace of the Legion of Honor, San Francisco and Occidental College, Los Angeles, 1962; and the La Jolla Museum of Art (now the Museum of Contemporary Art of San Diego), in 1963. In 1968, Hammersley accepted a teaching post at the University of New Mexico in Albuquerque. While he taught at the university for only three years, Hammersley remained in Albuquerque until his death in 2009. From the 1970s through the 1990s, Hammersley’s presence in L.A. was rare. However, with the exhibition I’ve Been Here All The While at L.A. Louver in 2000, coupled with a retrospective that traveled from the Museum of Fine Arts, Boston, MA, and the Laguna Art Museum, Laguna Beach, CA in 1999-2000, a national audience re-engaged with Hammersley’s work. Hammersley’s inclusion in Beau Monde: Toward a Redeemed Cosmopolitanism at Site Santa Fe in 2002, and The Los Angeles School of Painting: Karl Benjamin, Lorser Feitelson, Frederick Hammersley, June Harwood, Helen Lundeberg and John McLaughlin, 2004-2005 at the Ben Maltz Gallery, Otis College of Art and Design, both curated by Dave Hickey, further augmented his reputation. Pomona College Museum of Art’s Hunches, Geometrics, Organics: Paintings by Frederick Hammersley in 2007 was Hammersley’s last solo museum exhibition before he died in 2009. The Pomona exhibition included all 72 of Hammersley’s computer drawings. An illustrated catalogue is published in conjunction with the L.A. Louver exhibition. The catalogue reproduces the complete text written by Hammersley on his computer drawing experiences (originally published in 1969 by the scholarly art and science journal Leonardo) with images of over 24 computer drawings, as well as a full exhibition list and artist biography. The L.A. Louver catalogue is available free upon request and will also be accessible online at www.lalouver.com.